This fourpiece were derived from a group that came together in Liverpool as the Four Jays in 1959; they were Brian O'Hara, Joe Bower, Billy Hatton and Brian Redman. These later became the 'Four Mosts' because they discovered another group calling themselves by the same name. By the time that Brian Epstein 'discovered' them they had become the Fourmost and the line-up had evolved to that shown above. Epstein's connection with the Beatles proved to be of great value, and just as he'd done with Billy J. Kramer, he managed to secure 'surplus' songs from messrs Lennon and McCartney. The first of these gave the group a good start and they then had a string of substantial hits during the golden era of 'Merseybeat'. The group's Merseyside connections were never in doubt and they even appeared in the Gerry & The Pacemakers movie 'Ferry Cross The Mersey'. The first EP release of many artists is frequently just named after the artist or group involved. However, as if to amplify the point that Fourmost had a sound that was very much their own, their initial EP release is that shown here on the right GEP8892. It is their second release, which is a little more difficult to find, that just bears the name of the group. Sadly, Mike Millward died from cancer quite suddenly during early 1966 and, after several others had briefly filled the spot,.his place was taken by former 'Jay', Joe Bower. However, as the beat boom began to recede during 1966 so too did their chart presence. However, they continued to produce singles up until the end of the decade. One of their last uncharted issues was 'Rosetta'; produced by Paul McCartney and is alleged to feature the great man on piano. CBS 4461 1969 Easy Squeezy/ Do I Love You? 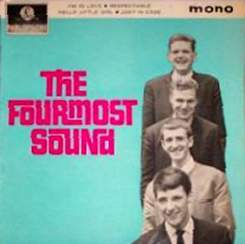 Parlophone GEP8917 1965 "The Fourmost"